Please also spread the words to your family and friends. The more people sign up and designate JLF as the charity of choice, the more fund will be raised for the Foundation. Thanks a lot! At the 25th anniversary of the loss of Jenny Lin, her family is hosting a memorial service on Friday, May 24th 2019, at the Castro Valley Library to honor the teenage girl. Alameda County District Attorney, Ms. Nancy O’Malley, and Sheriff Greg Ahern will both be present to deliver their remarks to the family and friends of Jenny. Following the ceremony will be a candlelight walk in downtown Castro Valley to remind the public of the unsolved murder and to raise awareness of child safety. Everyone is invited to share this special occasion. A young, talented musician and a straight-A student, Jenny was murdered in her own home on May 27, 1994, at the age of 14. This brutal death devastated her family and shocked the community. Jenny’s parents, John and Mei-lian Lin, vowed to continue working with the police until the case is solved, and to carry on Jenny’s dreams to see her life extended in a unique fashion. 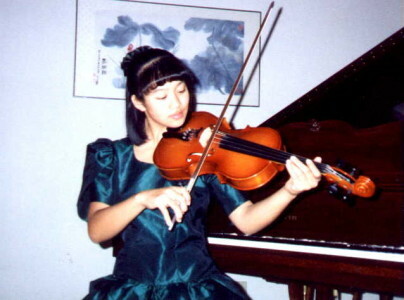 For over 20 years, the Jenny Lin Foundation has offered music scholarships and free music programs to the community each summer, and has organized numerous safety fairs, workshops and contests to raise awareness of child safety issues and to improve safety knowledge and precautions for parents and children. Last spring the Foundation embarked on a safety book project in collaboration with the Castro Valley Library. Titles covering a wide range of safety-related topics were added to its collection. The project was extended to the communities in San Lorenzo and Union City last fall, and the Foundation is looking to repeat the success stories with more branches of the Alameda County Library. To date, there is still no arrest or conviction related to Jenny’s murder. However, her family is hopeful that through continuous police effort and public help, this senseless, horrifying case will soon be solved. The recent arrest of the Golden State Killer for crimes committed 40 years ago boosts the family’s hope that one day the killer will be caught. A $100,000 reward for information leading to the conviction of Jenny’s murderer is still available. Anyone with information please call the Alameda County Sheriff’s Department at (510) 667-7721 or the toll-free hotline at (855) 4-JENNY-LIN. The Jenny Lin Foundation is pleased to announce that Ms. Lynne Foy-Couche and Mr. Greg Conway will be joining the foundation’s Board of Directors. Lynne Foy-Couche has been involved with Jenny Lin Foundation since 1994 and has been the JLF Summer Music Program Producer for many years. She has been honored to emcee the Jenny Lin Memorial since 2000, and she has also run the JLF Student Leadership Team Program since 2012. Mrs. Foy-Couche has taught for CVUSD since 1994 and is very honored to join the Jenny Lin Foundation’s Board of Directors. At the 24th anniversary of the loss of Jenny Lin, her family is hosting a memorial service on Friday, May 25, at the Castro Valley Library to honor the teenage girl. Alameda County District Attorney, Ms. Nancy O’Malley, and Sheriff Greg Ahern will both be present to deliver their remarks to the family and friends of Jenny. Following the ceremony will be a candlelight walk in downtown Castro Valley to remind the public of the unsolved murder and to raise awareness of child safety. Everyone is invited to share this special occasion. Merry Christmas to all JLF supporters! It’s the season to give to your favorite charities. Your tax deductible donation to the Jenny Lin Foundation at https://www.givedirect.org/donate/?cid=1304 will be greatly appreciated. Also, please support us when you shop at Amazon.com. Go to smile.amazon.com/ch/94-3208797 and Amazon donates to Jenny Lin Foundation. For updates on the investigation, visit www.alamedacountysheriff.org/jennylin.php. 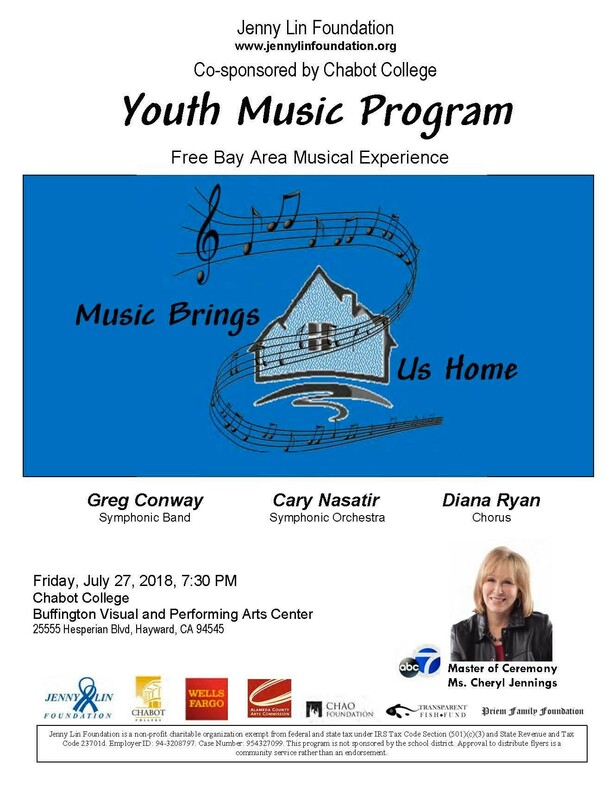 The schedule for 2018 Jenny Lin Youth Music Program is available. Click here for details.